Anyone who talks much with me knows that aside from Dust to Dust, I am also working on another mod recently that I came up with. This mod, currently named “Arcane Assistance”, is a magical automation mod. The idea came up when, after joining an all magic server, seeing other players complaining we had no good automation or sorting systems without tech mods. 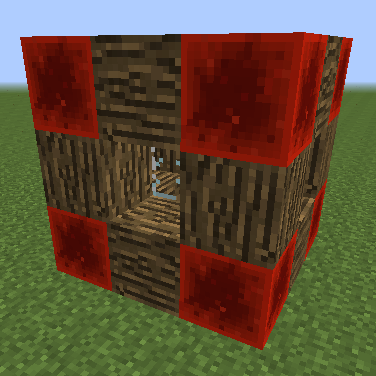 The basic idea behind the mod is that you use built structures in world (like above) as offerings to call a spirit. This spirit can then be placed in your base to automate things at a range. There will be different kinds of spirits, and biome based upgrades, but I’ll save that for another time. My plan is to allow the mod to automate nearly anything, although the structures to obtain the spirits are designed to be pricey, making this mod more mid to late game. I will be going into more detail on the mod over the next week or so. All the screenshots I plan to provide are mockups, as I am still working on the mod, and it is non-functional right now. Hopefully I can get some of the mod working so I can show off some real screenshots of it.